The day has gone and past by. It's yet another wet Wednesday. I'm shivering, I need a Heater. It felt like Winter. I'm not used to the cold water. It seems as if I'm a Stranger. I'm not used being a Hater. I've always been a Lover. I need a Breather, something Warmer. Can it be even Better? Heaven is more likely the days of Summer. In my own words, that is what My Heart says today. And, No, I'm not going to have my say any further. 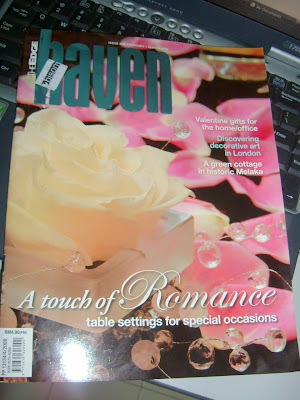 Go and grab a copy of this magazine! It's worth the read especially for any field of designers! If you asked me, Yes, I'm Loving It! I have more ideas rolling on my mind at this moment. Got it, got it ! Yes, finally! 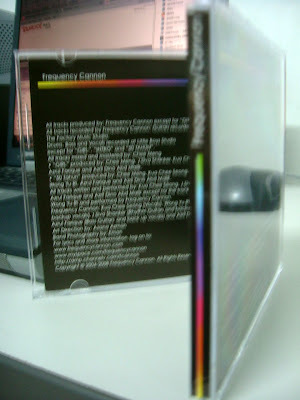 The Frequency Cannon cd that I won few weeks ago. And Thank God this time around it was in Purrrrrfeeeeecctttt condition! 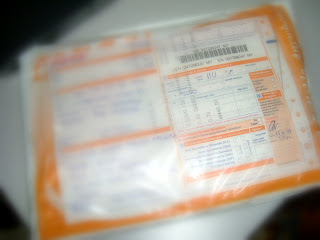 The parcel I received from PosLaju this evening. Sorry this picture has to be blurred for privacy reason. Contains address & mobile number of the band's drummer and mine. So better to be safe here. Right, right? heehe. 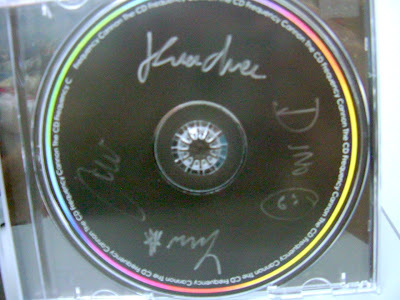 Well, here's the cd I got from them. Hey, they even wrote my name on it! Hmmmm....just ignore the reflection aights? Black,white and alil bit of colours. A simple design. Yet still a nice one. Art direction credits to: Azana Azman who also did the cd cover design for Estranged. By Kuachee, Dino, Azrul and Yuri. Sadly Siva is not in the band anymore. 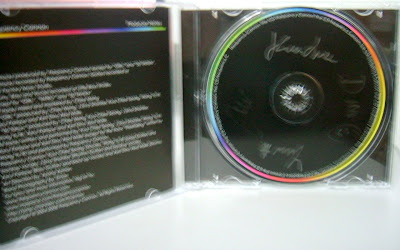 Thanks alot for the autographed cd! I just wish Siva could sign it too. Too bad lah. Anyways, you guys still rock my socks! Love you guys and I will continue supporting as long you guys keep on rocking! I leave you guys with the latest video from Frequency Cannon. I have alot on my mind. It's all in my head. All think about is my next vacation. Got to work out those SLR photography again soon. It's been awhile. I've been thinking of this lately. I just want to let it be. Right now, I just want to " Trust no one but myself and follow my instinct "
If it is for the best, that is what I will do. Just came back from Grandma's place just now for Station of the Cross prayer with all the family members. Not everyone were there. Only a few of us but it was great having to spend my Sunday with loved ones especially those cute lil kids. I didnt took alot of pictures as my camera ran out of battery. And I am a bit tired right now. Will probably continue tomorrow. Anyway, I just love this part of lyrics taken from the song Inconsolable- Backstreet Boys. I've memorized the number so why can't I make the call? Somethings its rather confusing. Some of it I would want to think as a denial. Maybe part of it just trying to make people believe which from what I knew it is not true at all. I don't know what to believe anymore. Who's making the right statement? I don't care now. Just don't fool anyone. The people around are not stupid. I repeat they're NOT. They can see and they can tell. Some might say that pictures are only pictures. Pictures can tell a thousand words. Never judge a book by it's cover. Yeah right. In this case, it's obvious. I bet it's true. Why deny something that is for real diba? When one said Yes and the other one said No, obviously something is definitely wrong here. Two person saying different answers to a same questions. Trying to mixed up what's on the minds of the people around the both of you. Such a denial. Sooner or later people will eventually know. Just tell what is happening. Hiding it wouldn't do any better. Can't wait to go to Grandma's place for dinner tomorrow! I could hear raindrops started to fall outside. While I am sitted here blogging on this laptop. Accompanied by the songs I love. Ooh, I just love listening to Michael Buble's every piece. Oops, the short timing raindrops just stopped. 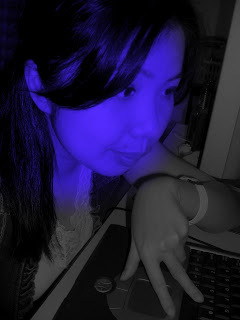 Maybe it wouldnt want to see me turning sad & blue. I won't. Coz I know even if the sun refused to shine, there will always be that ray of Sunshine in My Heart. May you Shine, Shine ! Take Care & Have a Safe and Great Weekend! After 15 days celebrating Chinese New Year, finally came Chap Goh Mei. Today our Chinese boss gave us an hour earlier to go home. Ya,just an hour. Doesn't really makes a difference diba? Heehe. At least got lah. Spend my Chap Goh Mei with my closest cuzzy today. Thanks for that lovely dinner treat! Those seafood are so masarap naman! And by the way, for those of you who's always viewing my Friendster or Facebook page or any other page profile I've got, I'm sorry I haven't got the mood to get it updated. Soon I hope. Only to those invited to my privatized photos though. Heehe. My Soul is Slowly Patching Up Again. 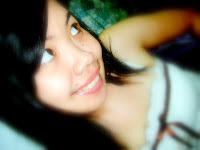 No Matter What Other People Say About Me, I Could Care Less ngayon. Yes, I was reading Maika's blog and saw her tagging me. 3. Tag 8 people at the end of this post and list their names. 4. Let them know that they have been tagged by leaving a comment on their blogs. Or anyone else who wants to do this! I have always love this song. One of my favourite Spanish song. And in my own words, I need to say this. Sorry for my broken language. El malo nuestro amor para la amistad ha muerto también, debido a una persona, todo se arruina, todos debido a ella. Sé que algo incluso no lo sabes. Ok, I'll stopped my crap for tonight. it hurts me to woke up so early. so I chose to continue with my sleep instead. It felt so good, really it did. For a second, I am dreaming being somewhere, anywhere but here. Again I'm blinded by the dreams I wish I could have. Reality Checked! Reality had woke me up! It's a Sunday and I'm busy here again. I need some space for spiritual time. It's already second Sunday of Lent. I need to spend more time talking to you God. Help me I wanna be a good Christian. Yes I really need to. Dad just told me about the price for the place I'm planning to go. I want to go somewhere else after my next trip. I really do. Will I be able to forked out that much amount of money? Or will I be able to get a leave again and again? What a tough decision to make. Warning : It's 14 to 10 degrees on this entry, so BEWARE. It's friggin' cold here. My legs felt like frozen which reminds me of the time where I was wearing a knee length jeans while walking on the streets of Baguio town at night. For long hours for goodness sake. Damn crazy man. My body just can't stand it. But I Do Miss Dat Place SoO Much! Huhu. Cold. I'm Cold. Not cool though. My Heart felt sO Cold. Everything's seems so Cold. I could barely explained it in words. I wished it was easier to describe it. But hell NO, it will NEVER be. I repeat NEVER. I wish it would. I thought I saw a familiar number. Please don't really believe me when I say , " I didn't "
Coz sometimes, what I really meant was, " I did "
It's confusing, I know. But if you Understand me, you will know. You know what? You are too! This is the place you found. Yeap, here is the place if you wanna know something. I just love saying dat! After a week of holiday, finally I'm back to work. All I think now is to focus on my job to get paid, eat good food, get healthy, fly as much as possible, and appreciate what I have, the people who won't let me down I mean. I want to be content and make everyone happy especially those in need. Eventhough I am not happy, but at least I can make someone else's better than mine. Who know's I might just find happiness along the way! And there are something's I dare not say it here. Let the wind just blew it away. Far, far over the rainbow or the sky. Too far beyond my reach. It passes by slowly. If you really know what I mean. I hope you knew. Yvonne, Good luck for tomorrow! You know for what right? Today marks my last day of the Chinese New Year Holiday. Can't believe I'm going back to work tomorrow. Today is someday I might not want to believe in. Yes. My best friend would called it Crap of the Day. Hahaha. But I gotta say Thank you so much for those who wishes me and my cousin in Kuching, Sarawak who called me. Appreciate it alot people! I feel LOVED on this day! Heehe. I used to think that I need a guy to celebrate V-Day. But what the heck. I don't need one. I have like family and friends to spread love with. I would not say that I hate man. I don't coz I have tons of beautiful guys with a gold heart around me. Hee. SoO Until the day I get to meet my true Valentine guy, I ought to have fun being Single. I thought I almost found one but too bad. Just too bad. Nuff said. Anyway, this is what I had for dinner just now. Very meaningful to me. The lyric really meant something. Happy V-Day! Eh, I tot I say I don't believe in that? So I told all of you that I cut hair. Well I did. But not that OBVIOUS though. 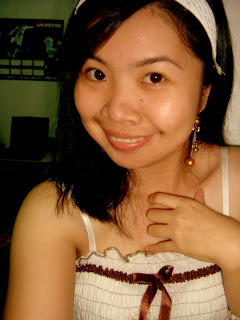 Actually , I only cut about 2 to 3 inches of my hair because it was badly damage. And I cut abit of my front hair. I wanted to keep my hair long but things happened recently & wanted so bad a new haircut. Blame it on the that ****! I couldn't sleep well last night due to my stomach ache. Darn. Sleepless night. I had to eat some medicine and got back to bed at 4 in the morning. Huhu. Thank God it was way better after waking up this morning. So I decided to make myself a breakfast. What a good start of the day making home-made meal diba? Spend the whole day doing the same thing again. There is like endless things to do at home. Oh well, at least I got something to do rather than nothing at all. Gotta walk out from the room now. Catch up with u guys tomorrow! I've got a new template! Yeah, finally! It was raining AGAIN today. Hell. Gosh, the weather doesnt seem to understand me. I have like tons of laundry to do and it keeps on pouring. Guess I really LOST my Sunshine these days. That makes me sad. Huhuhu. Not to mention it has been freaking cold. Too cold. Really way too cold. For a second I'd like to think and imagine that I was in New Zealand or something. Yeah rite, someone stopped me from dreaming. I WON THE FREQUENCY CANNON CONTEST ! I'm not sure if they gave me just because I'm one of the true fan or something but I'm just glad I won. Among all of the fans. Maybe luck was in me for being the earlist to enter. Heehe. Yeah baby, I did ! The drummer sent me a MySpace message yesterday and was sOooooo surprised !
" Why didnt you guys informed me through email? " " It was supposed to be a Surprise! Haha "
It was indeed a Surprise. But then, he told me through MySpace. Hahaha. I guess he was afraid that the thing they have sent might not reached on my hand. I just can't wait to receive the thing! P/s : Sorry. I have no mood to update on Cultural Extravaganza thingy. Pictures of me? Just give me some time. I owe you guys an apology. No, I don't have a blue Monday today. It has been raining the whole day. Huhu. Sunshine, where did you go? I am still busy with my room. Still pretty messy. I got a problem. Yes. I can't seem to throw the old things away. It is hard for me to leave behind the memories. Everything is so precious even a single piece counts. But I am going to try to get rid of it. I am thinking of donating some of it too. Maybe it will make the less fortunate happy. If it does, I will feel even more happier. For sure naman. The weather makes me lazy. Too bad. I'm going to dragged myself to be more hardworking. I think the vocalist of a band in the Philippines just add me in Friendster. Yael from the band Sponge Cola. I'm not sure if it's the real person though. But I think you should check them out in YouTube. The weather was very cloudy this morning. It was so dark, I could hardly rise up from bed. Forced myself out from bed to go to church. After having breakfast with the family, we head down to a department store. Did you noticed that I always mention Family? In case you were wondering, Yes, I love spending my time with them. They are always going to be my priority. I'm a Family person Indeed. I bet someone never noticed that. and another Malaysian book called " The Hiplist Wedding Photographers "
Spending some money makes me happy nowadays. To ease my mind, I'll do what it takes. Btw, Wish me luck guys! I've got like 3 more days to finish re-arranging my room! i just wonder how it will turn into. Ok then, don't want to go much detail here. So much things to say but I have no idea how. Started off the day going breakfast with the family. And after breakfast in Inanam, we went straight to some pottery shop. Mum and Dad bought some pots for the gardener to put some plants. Spend the rest of the day at home with siblings. Doing a lot of stuffs like cleaning up my room and throwing stuffs that are not important to me anymore. I need to clear everything. Planning to sort things out here and there. Fuh, I am so in need of change coz I tend to get easily bored looking at how things look like nowadays. But I need more time. Gonna spend my holidays occupied with my room. I decided to do something TODAY. I just can't help it bah. Shhhh...I better shut up & keep it to myself. Otherwise, someone over in L****n is so going to read this. I know. It's a WORLD WIDE WEB remember? dats it. gotta go to bed now. Today is Ash Wednesday on a Friday. Stayed home again for the whole day. Was too lazy and tired to do anything. For once, doing NOTHING is really SOMETHING. Sound way too good to be true. Lovin' it ! I spend the rest of the late evening attending church mass. And guess who I found? My Best Friend ! Yes, Indeed. Apparently, my best friend had to come back again because of the grandma. Just so they could celebrate Chinese New Year together. Nice. And I am sOo so glad that I bumped in to J* today! Kept asking me how am I doing after all that sh*t happening. Told I was doing okay and gave me a pat on my back. Although it was just a short bumped-into meeting but it was worth it. You know like what they say, " Short and Sweet." The reason was I miss having the best friend around. The other one I meant. The only one who I could turned to for advice and opinion these days since YOU are not here to listened to me anymore. And J* understand me more. So much of saying that you will be there for me no matter what happened is CRAP. Hope tomorrow shines for me! Maybe I'm better off without you! As I don't have my CPU fixed just yet, I may have to blog without uploading some pictures. Pretty boring I know. But what the heck. I will go on with it. I spend the whole day doing nothing but relaxing. As there were no visitation during the day. I had like too much of Ponkam which is Honey Mandarin Orange in English till I felt like having a sore throat is killing me. It was sOo Sweet and tasty compared to Lukam, I couldnt bare resist eating it :) Not to mention, the red meat and the kuih bakul Dad bought too! My family and I were having a dinner at my uncle's place just now. I was having a very bad stomach upset before dinner but guess it all went well after I flushed out everything and I was eating like a cow even when you knew it. I enjoyed my meal after all. Okay lah, I have to end right here. I haven't got the chance to update blog again these days. Even to update my pictures, it was way difficult for me. Yes indeed. Excuse me for the long wait. He's acting crazy again and again. That handsome Blue CPU of mine. Since I am off from work today till Valentine's day, I'm going to be free for Chinese New Year's. It's not that I even celebrate V-Day but I have no choice cause my work place will be close that time. And now here I am blogging using a laptop once more. But for once, I wanted to be in China or Taiwan. Or even Hong Kong will do. Putting the images of cold weather with beautiful flowers surrounding me. Cherry blossoms on a breezy Winter days. It must be Heaven. Don't you think so? Yes, I love dreaming. Dare to dream they say. It aint a crime is it? Ooh, it must have been a wonderful journey going there. Perhaps I might find my ancestors in China. The long lost relatives of mine I don't even know if I could track them down. I wonder. Happy Chinese New Year's Eve to All ! I woke up greeting Sunday toO early as I was used to waking up early. Yes. Guess I'm used to it. Eventhough I knew I could wake up late today. Man, I still havent recovered from not having enough rest and sleep yet. I just hope I dont end looking like a racoOn. People have been asking me, " So what's up with you these days? " " Not much. Life's been busy lately & pretty messed up toO! " You wouldn't want to know. Even if you do, I won't tell. It's not that as I mentioned SUPER-DUPER-REALLY-BUSY, but then I'm trying to make myself pretty occupied these days. I am sOo loving it when I aint got any time to even think about it. If I had the money, I want to travel around the world. I wish. These days, I try not getting too much attached to my computer since I got my CPU back. I felt it needed a break and I am going to do something else besides my toO much love for the internet. It's sOo Addictive I know. But it can be DANGEROUS too. Heaven sake, I'm gonna have a LIFE out of the box rather than too much of it. Now that it is no longer here, I'm going to have a peaceful sleep and NO ONE will bug me at 3 in the morning anymore. But kinda miss it tho. Today it's simply not ordinary in my eyes. Besides the laundry on sunday tho. I CUT MY HAIR ! Or maybe some at my other networking site. Facebook is rather annoying right now. It pisses me off! Really! When someone asked me just now how am I feeling today, I told them that it was just OKAY. Yeap, that is how I am feeling right now. Had a few spare time for conversations on the net during my office hours despite having to do endless printing job. Hell yeah, I'm very capable of multi-tasking. Hee. I am definitely Stronger than Yesterday. I had a blur moment for awhile. Someone actually called me up just now. 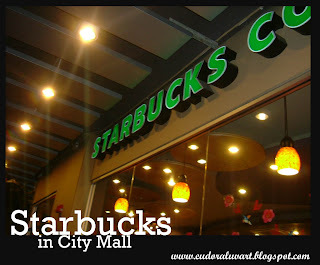 0310 on my screen.Ermmm....while I was in Starbucks. I didn't quite hear it as they was like alot of people there. I'm not sure who that person was. Probably because the connection was pretty bad. If anyone happened to call me, I'm sorry. If you are reading this, please leave me a comment here and let me know who you are. P/s : I will update the pictures as soon as I got the time. As I am so sleepy right now. It's 2 o'clock in the morning for goodness sake. Ought to go ooze off.